Week 38 – Things are always working out for me. In July I did something I’ve wanted to do for a long time. I hopped in the car with my friend, Julie, and drove two hours to a beach in southern Mass to ride waves. 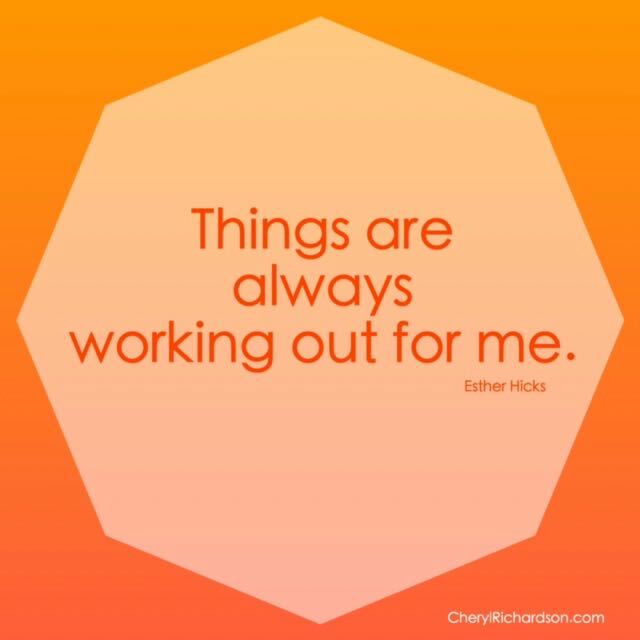 On the day Julie and I drove to the beach, she introduced me to a YouTube video called, “Everything is always working out for me,” by Abraham (Esther Hicks). It’s a thirteen-minute compilation of affirmations put to music and it’s designed to kick your mood (and vibration) into high gear. When we finished listening to the audio in the car, I felt energized and uplifted and I knew I wanted to listen to it again. So I folded it into my daily routine. Every time I got in the car, I started my trip listening to the video. If I woke up in a bad mood, I listened to it before I began the day. And if something happened during the day that made me frustrated or upset, I often took a break and listened to it again. Over the last month or so, this inspiring video has had such a positive impact on my mood, my thinking, my energy, and my ability to get back in the flow, that I wanted to share it with you, too. At our core, we’re energetic beings and we are profoundly influenced by what we put into our eyes and ears. Why not put worthwhile, positive messages into your consciousness and see how it impacts your life? Here’s a video/song sent in by Kathy, a member of our online community, who uses it to lift her spirits. Check it out here. Thanks, Kathy !